Pearl Creations was contacted early February to supply buttons to a McMaster University Group organizing a show to raise money for a cause. They needed to advertise the event through cool buttons and so I was contacted.During the first meeting with the Organizers, I told them this would be All-Me Buttons order which means they will be $2.50/pin. They wanted 100 pins and asked for a discount. Since it was 100 units, they had a choice of 1.0-inch, 1.25-inch or 1.5-inches. I showed them a few samples and they wanted the 1.0-inch buttons.I offered the students’ discount of $1.50/pin, but then after some deliberation, I had a rethink. These were students trying to raise money for The Invisible Children. I checked the website and I realized, this wasn’t a business matter, I was offering a service so I made a compromise that was still in Pearl Creations’ interest (of course), my conscience’s interest and the interest of the organizing body. I offered a undisclosed discount which was duly much appreciated. Payment was made soon after and the buttons provided. 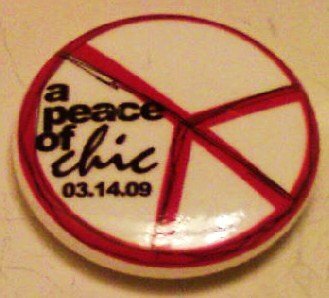 The buttons are for an event tagged “A Peace Of Chic”. It is a fashion show scheduled for Saturday, March 14th, 2009. It promises to be a blast! 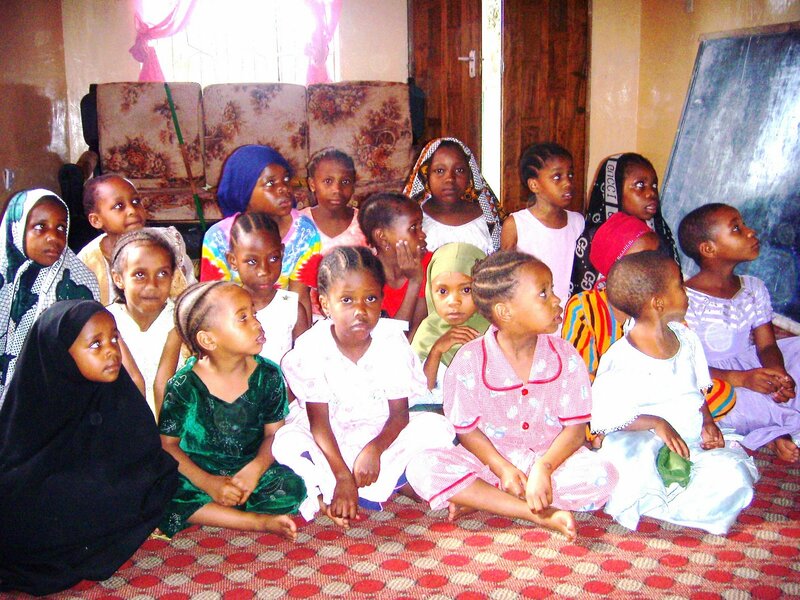 Remember Amal A * and her noble act: The Um-Aisha Orphanage? Well, we hooked up again for a Partnership recently and…actually, first let’s rewind – After Afrofest, we got talking about what she does, how she started and why. Hmmm, now, that I think of it, I didnt get one of the cool bracelets she was selling to raise money for the welfare of the kids. They were pretty neat too.Anyway, she asked if she could place an order sometime for buttons…She already had a couple of designs in her head that she just had to put on paper or PC as it were. Unfortunately, because I was a MASA Executive, I had to help with the clearing up, disassembling of the stage and all. So after rubbing minds for a few minutes, all we walked away with were first names and mobile phone numbers. Calling was going to be a little hassle cuz she attends the University of Waterloo in Waterloo ON, but lives in Mississauga (I think); and I’m in McMaster University, Hamilton ON and live there too…so it would have to be long distance calls either way because we would always be in two different cities. We were supposed to meet the next day- Sunday, to talk a little more about the buttons to create awareness on the Orphanage, but I was so exhausted after clearing up, running errands and dropping people off that I woke up at about 1:15pm. Well, partly cuz I fell asleep at about 6:30am. By the time, we (Executives and Planning Committee Members) finished our final errands, it was evening time…and I guessed she would have been well on her way back to Waterloo by then. A few days after, I tried finding her on Facebook, but to no avail. I think they’re just adorable. Anyway, she also explained what she expected the design to be: an outline of the map of Africa with the Tanzanian Orphanage Awareness written across with in the Tanzanian flag colors: blue, yellow and green. In these matters like this, I think up a design and sketch it; and then send the sketch to Alice with instructions on how it should be colored, arranged & the fonts to be used. She then creates the proofs. She is usually involved with the designing whenever I’m bombarded. Anytime, I cant handle a project alone and have no time to design, she gets right on it with/for me. or example, I’m focused on my finals for the session! In case you’re wondering, Alice C* is my Business Partner/Associate in the United Kingdom. I mentioned her in my first interview with The Hamilton Spectator. She also runs her own Company and has slightly similar concepts as mine! How weird is that!? If we finally settled on this and I’ve given her a great deal. One in the league of that of the Invisible Children (if you read this regularly, you know what I mean). What ever the case, I hope in our little way, Pearl Creations helps these kids a great deal! 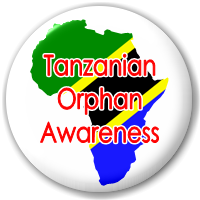 You can also help the Um-Aisha Orphanage and support Amal by joining the “Save The Orphans of Tanzania” page of Facebook via link. Find out how you can help and spread the word! Over the past year of running Pearl Creations, I have discovered to keep to time and separate business from pleasure…well, in this case, from my personal life! I discovered I wasn’t getting enough sleep ‘cuz I was working round the clock! I come back from school, check the company’s email, respond and get the buttons designed. I have dinner and then I study an average of 3 hours ending at about 4:00am/5:00am. Before retiring to bed, I check Facebook messages and emails again; and if they are more, I reply them! I sleep 5:30-ish and I have to be up at 8:30am every morning. I realized this was because I didn’t set a time frame for myself and so I did. I started by updating the website over one weekend, added new pages, changed fonts, colors, designs…and made it super cool. I was so impressed if I may say so myself. Anyway, I set a business time frame set of Mondays – Saturday from 8:00am EST to 8:00pm EST. Now, weekdays, I design all the orders for the week only. On Saturdays, I handle the production and payments only. In other words, orders received on Saturdays will be arranged in order of arrival and designed for the following week/business day. Sundays, I have the day off. 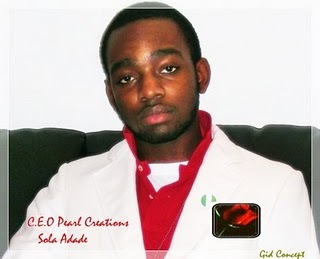 Next, I realized people sending emails to mr.buttons@live.ca would address it to Olusola, Sylvester or Sly…which I appreciated, but unfortunately, it is a business email which could be checked by me (presently) or any one of the Buttoners (nearest future). I also believe replying people casually will eventually cause unnecessary familiarity which in turn will make it difficult for them to take the business or costs seriously. It was also making me not business-minded. I decided to reply formally as long as the email is to Pearl Creations. I also added a signature: “customer service” and according to the email, there was the appropriate department. For example, normal emails were from the relations & products management department. Payments from the billing and finance department etc. Emails that needed my personal reply should be replied semi-formally as Sylvester. Now everything’s just peachy and well balanced. I get enough rest, enough work (buttons and school) done. I’m Mr. Buttons, the businessman when it’s time for work – replying company emails, taking orders and making buttons. And then, the student, Sylvester, at school. I alternate between normal and business modes as the situations may require…like I have sort of an alter-ego lol. Shortly after my moment of fame being in the local newspaper and all, I started putting buttons on my hoodies, t-shirts and later, on my School bag. I started with only the National Buttons. I put Nigeria, Canada and flags of countries whose nationals were quite a lot in Hamilton. For example, China, Italy, Kenya, Scotland, Somalia and Sudan. One day, on my way to school, I boarded a bus and sat down. Since I hardly take my school bad off, the man behind trying to get my attention snapped my bag. I turned around and then he asked me if I was a Nigerian. Puzzled, I said yes and then he smiled. 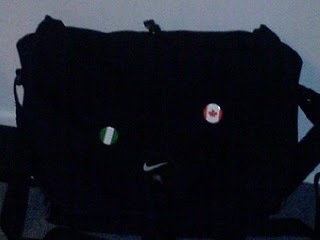 He said the reason he asked was cuz of the Nigeria button on my bag and then I smiled. He asked where I got it. And of course, i told him I made them. He asked how much I sold them. i told him $2.00CAD for the flag buttons. He asked if I had I think 5 or so. As God would have it, I did! Well, I did…including the one on my hoodie and bag respectively. I gave them to him and gave me $10.00CAD. He told me his name and said he was from the Niger-Delta Region; and I told him I was from Lagos. We shook hands and I had to bolt off to School. 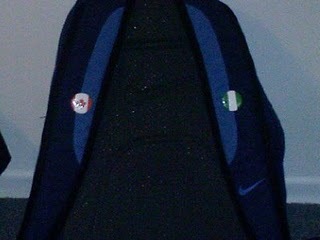 Because of that day, they’re still on my school bag still date along with some All-Me Buttons which attracts teenagers. As business progressed, I got another bag, a black Messenger bag, to use for carrying packages for delivery. In the beginning, I had just one or two buttons, but now, it’s packed with so many buttons, it’s ridiculous. 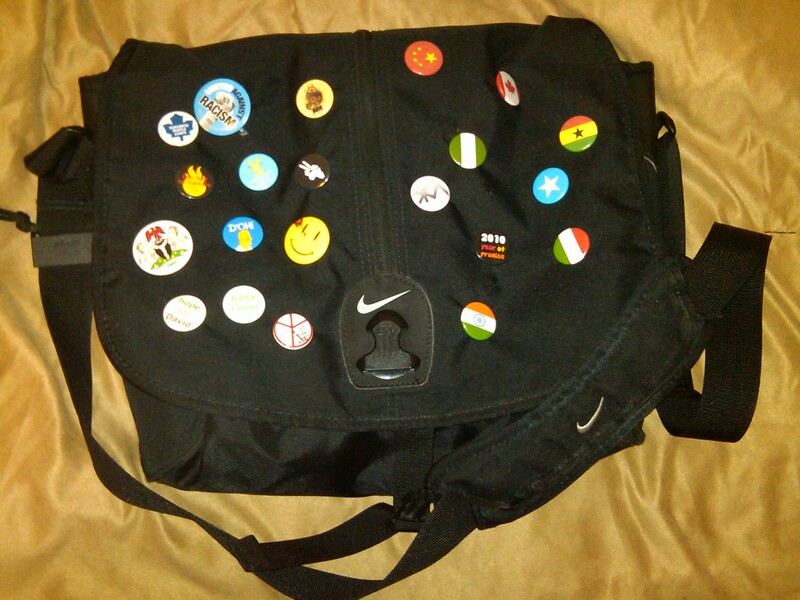 I call it my Buttoned Messenger Bag. Anyway, so I’m on the bus to school and some guy, a student as well, asks if me all the buttons on my bag are countries I have been to, I laughed and said no. He asked what countries they were and I told him. Then he gave me a free one that was like 2 inches. It said something about anti-racism, but it was cool. He didn’t know who I was, but said he would be calling me ‘Mr.Buttons’. What a coincidence! lol!